The use of nanomaterials as composite reinforcing materials has shown significant interest in recent years. Both carbon nanotubes and clay nanoparticles have been studied as a means to improve composite properties [1,2,3,4,5]. The quality and performance of nanocomposites depend strongly on the interaction of the components at their interface. To enhance the adhesion properties at the interface, nanomaterials are often exposed to various surface functionalisation processes. Filler-matrix interactions are commonly described by adhesion and cohesion phenomena. Both properties depend on the surface energetic situation of the materials commonly expressed by the surface energy. In this study, surface energies of different multi-walled carbon nanotubes (MWCNT) and nanoclays with different surface treatments were determined by IGC SEA. Nanofiller-matrix interactions have been calculated by means of the thermodynamic work of adhesion from the surface energy values and correlated with composite mechanical properties. IGC SEA is a well-known tool for the characterization of particulates , fibres  and films . IGC SEA involves the sorption of a vapour (probe molecule) with known physico-chemical properties onto an adsorbent stationary phase with unknown physico-chemical properties. This approach inverts the conventional relationship between mobile and stationary phase found in analytical chromatography. The stronger the interaction of the vapour phase (known properties) with the unknown adsorbent (unknown properties), the more energetic the surface and the longer the vapour phase retention time. For this reason a range of thermodynamic parameters can be derived from the retention behaviour. A detailed explanation of the theory is given in Reference . One of the most commonly used parameters for the description of the energetic situation on the surface of a solid is the surface energy. The surface energy is analogous to the surface tension of a liquid. Surface energy describes the interaction between cohesive and adhesive forces which, in turn, dictate if wetting occurs. In practical terms, the higher the surface energy the more reactive the surface. The surface energy parameter can be divided into a dispersive and a specific component. The dispersive surface energy can be directly calculated from the retention times of a series of injected n-alkanes . The specific contribution of the surface energy is obtained indirectly via the specific free energy, obtained by injecting a range of polar probe molecules. By applying an appropriate concept, the acid-base numbers can be calculated from the specific free energies. The study of acid-base properties by IGC SEA has the additional benefit that changes in the orientation of surface groups can be studied. Those changes are not necessarily related to variations in composition. For this reason spectroscopic methods are less appropriate for the study of these effects . A common approach for acid-base calculations used in IGC SEA is the van Oss concept , which provides acid and base numbers in the same units as the dispersive surface energy. In Equation 1 above, γS+ and γS- are the electron acceptor (acid) and electron donor (base) parameters of the surface and γL+ and γL -are the electron acceptor and donor parameters of the probe molecule. Unfortunately, in its original form, this equation can only be used for relative comparison due to inaccurate starting parameters leading to an overestimation of the basicity . To correct this and decrease probe sensitivity, the input parameters have been rescaled for a more reliable determination of acid/base values according to Della Volpe . Multi-walled nanotubes (purity > 95%, diameter 10-30 nm, length 0.5-40 μm) were obtained from commercial sources. Information on the synthesis, purification, and thermal treatment history of these materials was not known. The material was used as received (AR-MWCNT). The MWNT were then oxidized by sonicating and refluxing in 9.5 mol/l HNO3 solution to produce surface COOH groups (MWNT-COOH). The clay nanoparticles were Laponite, a synthetic hectorite (Southern Clay Products). This material was used as received (AR-nanoclay). The material was further treated with to include isocyanate groups (fNCO-nanoclay). Isophrone diisocyanate (IPDI) (Desmondur I, Bayer, USA) was used for the NCO functionalisation. One particular characteristic of this monomer is that one of the two NCO groups is five to ten times more reactive than the other NCO group. Dibutyltin dilaurate (Aldrich) was used as the catalyst. Polyurethane (PU) was used as the model matrix material. PU consisted of an acrylic polyesterpolyol (Joncryl 588, Johnson Polymer) and a biuret hexamethylene tri-isocyanate (Desmodur N3200, Bayer, USA). Anhydrous ethylene glycol dimethyl ether (DME, Acros Organics) was used as the solvent for the PU functionalization reaction. Anhydrous reagent grade acetone was used for composite processing. PU/MWNT composites were fabricated at nanotube loadings of 0.5, 1 and 2%. 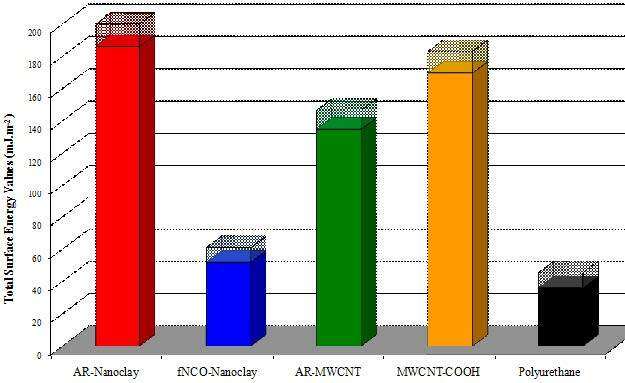 The PU/nanoclay composites were made at nanoclay loadings of 0.5, 1 and 5%. The loading percentages were based on the mass of nanofiller over the mass of the PU polymer. For the nanocomposites, free-standing films were prepared by the following steps. First nanomaterials were sonicated in acetone for 2 h. The particles were then dispersed in polyol and further sonicated for 1 h using an 80 KHz tip sonicator. After high shear mixing the samples were degassed under vacuum at room temperature for 1 h. Finally, the nanocomposite mixture was drawn down onto release paper and the resulting films were cured for 4 days at ambient conditions followed by a 4 h cure at 130 °C. Final film thickness ranged from 50 to 100 μm. For the IGC SEA experiments the samples were packed into silanised glass columns (30 cm long, 2 mm ID). Prior to measurement the sample was pre-treated at the measurement temperature for 2 hours in situ to remove any surface vapour contaminants. IGC SEA measurements were performed using the SMS-IGC SEA 2000 system (Surface Measurement Systems, UK). The MWNT and nanoclay samples were measured at 373 K with a helium carrier gas flow rate of 10 ml/min. Straight-chain alkanes (decane through hexane) were used as dispersive probe molecules. Dichloromethane and ethyl acetate were used as acidic and basic probe molecules, respectively. The probe molecules were injected into the helium stream via a loop with 250 µl volume at a concentration of 0.03 p/p0 to obtain infinite dilution conditions where only vapour-adsorption interactions are measured. The dead-time was determined by a methane injection. The surface energy for a polyurethane film was measured via contact angle. The contact angles of water and diiodomethane were measured using droplets (2μL) of each. The resulting dispersive and specific (polar) surface energies were taken from the averages of 6 measurements on the polyurethane film. Mechanical properties (tensile modulus, tensile strength, and yield strength) of the PU/nanofiller composites were measured by dynamic mechanical thermal analysis (DMTA) in tensile mode at an extension rate of 0.02 mm/s. Sample geometry was 45 mm x 5 mm with thickness ranging from 50 to 100 μm. Tg values of the nanocomposites were obtained by DMTA in dynamic mode at 5 Hz frequency, 0.1% strain, between 30 and 170 ˚C, and 30 mm x 10 mm samples. Figure 1 displays the dispersive (solid bars) and specific (shaded bars) contributions to the total surface energies for the MWNT, functionalized MWNT, nanoclay, functionalized nanoclay, and PU samples. The surface energies for the MWNT, nanoclay, and derivative samples were measured via IGC SEA, while contact angle was used for the PU film. For the nanotubes, the MWNT-COOH sample has a significantly higher total surface energy compared to the AR-MWNT sample. This could be due to the severe HNO3 acid treatment introducing defects and shortening the nanotube length . The aggressive oxidizing appears to make the MWNT more reactive. For the nanoclay particles, the AR-nanoclay has a significantly higher surface energy compared to the fNCO-nanoclay. Clearly, the isocyanate functionalisation step drastically passivates the surface of the nanoclay particles. Figure 1. Dispersive (solid) and specific (shaded) surface energies for the nanoparticles and PU film. Compared to the pure PU material, the addition of MWNT material had a profound impact on the mechanical properties of the composite. For instance, with a 1% AR-MWNT loading (by weight), the modulus, tensile strength, and yield strength increased by 94%, 98%, and 60% respectively  when compared to the PU matrix alone. The MWNT type or loading amount had little effect on the Tg of the PU (See Table 1). Between the two MWNT samples, the composites with the AR-MWNT material had improved mechanical properties compared to the MWNT-COOH composites. For instance, at a 0.5 wt% loading, the modulus was 1.93 GPa for the AR-MWNT composite, but only 1.53 GPa for the MWNT-COOH composite (see Table 1). For the nanoclay samples, there was a 36% increase in modulus for the AR-nanoclay composite compared to PU alone. However, addition of the AR-nanoclay caused a decrease in the tensile strength and elongation at break, indicating the composite becomes more brittle . Combined, these results suggest that the AR-nanoclay does a poor job at transferring stress from the PU. However, the modulii for the fNCO-nanoclay composites were higher than those for the AR-nanoclay samples. 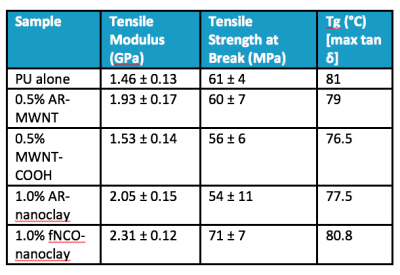 For instance, incorporating 1.0% (weight fraction) of fNCO-nanoclay increases the modulus by 58% and increases the tensile strength by over 16% (see Table 1). The improvement in mechanical properties (tensile strength and modulus) of the fNCO-nanoclay composites suggest the isocyanate functionalisation improves interfacial transfer mechanisms for these materials. Table 1. Mechanical properties and Tg of the nanofiller/PU composites. In the above equations, Wad is the work of adhesion, Wcoh is the work of cohesion, γD is the dispersive surface energy and γSP is the specific surface energy. The Wad/Wcoh ratio gives an indication of the balance of forces between adhesion and cohesion. For instance, if particle-particle interactions are too high, resulting in a high Wcoh value and low Wad/Wcoh ratio, then agglomeration or poor particle dispersion may occur. Also, if the particle-matrix interactions are too low, resulting in a low Wad and low Wad/Wcoh ratio, then poor particle-matrix adhesion may occur. Ideally, formulations should be developed to optimize the Wad/Wcoh ratio. Table 2. Thermodynamic works of adhesion cohesion values for the nanofiller/PU composites. Comparing the values in Table 2 to the mechanical performance of the MWNT composites shows an interesting correlation. The AR-MWNT composite had superior mechanical properties and a higher Wad/Wcoh ratio compared to the MWNT-COOH composite. Therefore, the thermodynamic adhesion predicted from the surface energies correlated to actual composite performance. The very high surface energy for the AR-nanoclay sample (202.1 mJ/m2) and resulting low Wad/Wcoh ratio suggest that nanoclay particle-particle interactions dominate thermodynamically. This may lead to increased segregation of the particles or poor dispersion, resulting in decreased particle-matrix interactions. The mechanical data for the fNCO-nanoclay composites indicate an improvement in composite strength. The total surface energy value for the fNCO-nanoclay material (60.9mJ/m2) is much lower than for the AR-nanoclay sample, indicating a passivated surface. The lower surface energy decreases the particle-particle interactions (cohesive forces) which should increase particle-matrix interactions. The Wad/Wcoh ratio is much higher for the fNCO-nanoclay-PU pairing (0.86) compared to the AR-nanoclay-PU pairing (0.47). Therefore, the thermodynamic adhesion values predicted from the individual component surface energy values agree favourably with the mechanical performance data of the composites. The surface energy values measured by IGC SEA on MWNT and nanoclay particles were used to predict polyurethane-nanoparticle composite performance. For the MWNT samples, oxidizing with HNO3 made the surface more reactive, which could lead to increased particle-particle interactions and decreased interaction with the PU matrix. The decreased modulus of the MWNT-COOH composite corresponded with the lower Wad/Wcoh ratio. For the nanoclay samples, the AR-nanoclay had a much higher surface energy and much lower Wad/Wcoh ratio than the isocyanate treated material. Also, the fNCO-nanoclay composite exhibited superior mechanical properties. Together, these results suggest poor particle-matrix interactions between the AR-nanoclay particles and PU, but improved particle-matrix interactions for the fNCO-nanoclay material and PU. This paper highlights how surface energy values can be used to measure changes in surface chemistry and ultimately predict composite performance. Surface Measurement Systems thank Aline Granier, Bastien Pellegrin and Tinh Nguyen for their contributions to the case study. Thielmann, F., J. Chrom. A 2004, 1037, p 115.
 van Astem, A. et al, J. Chrom. A 2000, 888, p 175. Pawlisch, C., Macris, A. and Laurence, R., Macromolecules 1987, 20, p 1564. Schultz, J. et al., J. Adhesion 1987, 23, p 45. Buckton, G. et al, Intern. J. Pharm. 1991, 72, p 157. Oss, C., Good, R. and Chaudhury, M., Langmuir 1998, 4, p. 884. Della Volpe, C, Sibioni, S., J. Coll. Interf. Sci. 1997, 195, p. 121. A. Granier, T. Nguyen, A. Shapiro, and J.W. Martin, Adhesion Society Annual Meeting Proceedings, 2007. B. Pellegrin, A. Granier, and T. Nguyen –Adhesion Society Annual Meeting Proceedings, 2008. We have team of experts in science and technical support for our customers.